Jodhpur is the second largest city of Rajasthan. It is a historic city and the origin dates to the year 1459 AD when it was founded by Rao Jodha, the Rajput chieftain of the Rathores. This imperial city echoes with tales of antiquity in the emptiness of the desert. Standing as the sentinel of the country's western border, Jodhpur is famous for its magnificent forts and palaces. The city is known as the Sun City for the bright, sunny weather it enjoys all year. 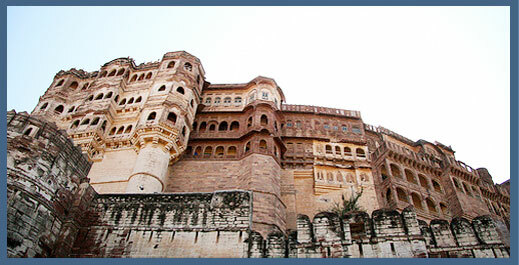 It is also referred to as the Blue City due to the indigo tinge of the whitewashed houses around the Mehrangarh Fort. Lending a romantic aura to Jodhpur, are its exquisite handicrafts, folk dances, folk music and the brightly attired people. The city has its own airport. Trains are available from Delhi and Mumbai to Jodhpur. It is also well connected by the national highways and other small roadways. Jodhpur has some of the India's best hotels, which compliments the scenic and architecture beauty of this Blue City. We at Travel Made Easy, provides you with the reservation facilities of some of the well known beautiful, comfortable hotels in Jodhpur, to make your stay a memorable one.